We have carefully developed a tool that "grades" a storm and then assigns a SCALE to help you analyze storms and get your assets in place quickly. Several conditions and dynamics are taken in to affect in order to provide you with clear data. 1 Potentially Damaging Potential damage to fruit, crops, vegetation. 2 Isolated Minor Damage Minor damage to vehicle bodywork and tiled roofs in an isolated area. 3 Isolated Damage Damage to tiled roofs in populated areas. 4 Widespread Damage Damage to tiled roofs and glass in several populated areas. 5 Widespread Destruction Severe damage to tiled roofs, grounded aircraft, and a risk of injury in several heavily populated areas. The characteristic damage associated with each increment is listed in the table above, but you should keep in mind differences in building materials and types; e.g. whether roofing tiles are predominantly slate, shingle or concrete as well as the age of the roof. "Did it hail?" "How big was it?" "Where was it?" Let's face it: Everyone asks these questions almost immediately following severe weather. The good news is; using HailStrike tools you can know the answer within minutes after a storm. 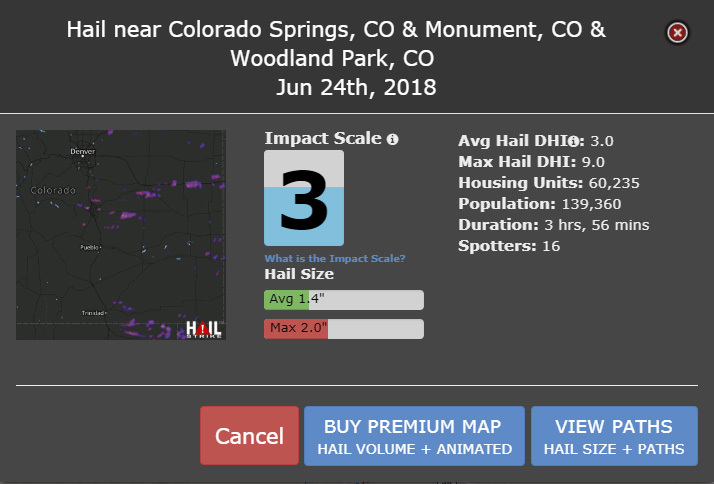 View the hail size, direction, hail paths, population in an area, housing units in an area, and spotter reports (ground truth). Our premium AniSwath hail map can also be viewed which will show you the intensity and duration of hail. If there was a ton of 3/4" hail as opposed to only a few stones of 2" - wouldn't you want to know that before you spent time and gas to find out otherwise? This scale was partly based on the TORRO Hail Scale. 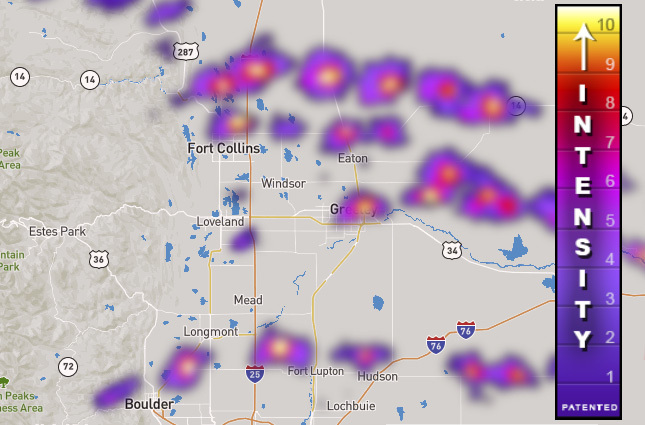 We utilized NOAA's hail size as well.